SA business icon, Rick Allert has been a Patron since 2008. Rick is a long term supporter and was actively involved as Campaign Chairman during our 1997 and 2012 capital campaigns. 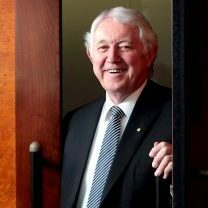 Rick was awarded Member of the Order of Australia (in 1997) and was elevated to Officer of the Order of Australia (in 2008). We are fortunate to have Rick's ongoing support and we thank him for his patronage. 'The Mary Potter Hospice plays a pivotal role in Hospice care for South Australians, carrying out its service in a caring environment with the highest level of compassion, which is appreciated by all. 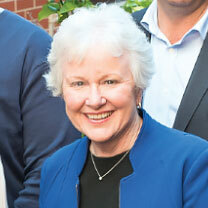 The Mary Potter Foundation's task is to raise and provide much needed funds so that this high standard of caring environment and compassion can be maintained into the future. Jenny has been working alongside the Foundation team since 2012 with a wonderful willingness to use her networks to support ongoing upgrades to the facilities in the Mary Potter Hospice and Calvary. Through her initiative, 'Chip in for Calvary' Golf Day, four projects have been delivered including a beautiful family kitchen in the heart of the Hospice; a welcoming and reflective garden between the Hospice and the cancer ward; upgrades to the joinery in every patient room; and, contribution to the cancer ward upgrade (alongside the Hospice) transforming the ward into a bright and airy space. Jenny is an active member of the South Australian community and her passion for the hospitality industry is matched by a personal commitment to helping others. We are fortunate to have someone of Jenny's caliber as our Patron. 'I am so pleased to be able to support the Mary Potter Hospice and other palliative care initiatives for people in our State. I believe as a society we must learn to talk about dying and understand that there comes a time when the focus must be on dignity and compassion over ongoing treatment. If I can play some small part in raising awareness and funds I am more than happy to do so.